South Carolina state health and environmental officials say a wastewater treatment plant is not working due to flooding from Hurricane Florence and untreated wastewater is now being discharged into a tributary that feeds the Waccamaw River. Grand Strand Water and Sewer Authority notified the Department of Health and Environmental Control on Wednesday about the situation affecting the Conway Wastewater Treatment Plant in Conway. DHEC says it’s in contact with Grand Strand Water about the situation and other wastewater systems in the area to check their systems’ status. Residents are advised to avoid contact with water around and downstream of the Conway facility. Florence’s rain, wind and flooding already are nearly three times more costly than Hurricane Matthew’s total devastation two years ago in North Carolina. The state Agriculture Department said Wednesday that crop and livestock losses already are estimated at over $1.1 billion in North Carolina. The department says the total from Matthew was $400 million. Nearly $1 billion of the estimated losses come from row crops. Agriculture Commissioner Steve Troxler has said he expected losses to be great because harvests were under way or just getting started. Troxler said last week he anticipated agricultural losses in the billions of dollars when calculations are complete. Preliminary losses for forestry are $70 million and $23 million for livestock, poultry and aquaculture. Livestock losses in North Carolina are now estimated at 4.1 million poultry and 5,500 hogs. An environmental group is joining with state officials in telling residents and tourists in North Carolina that it’s not yet safe to swim or wade in coastal waters. 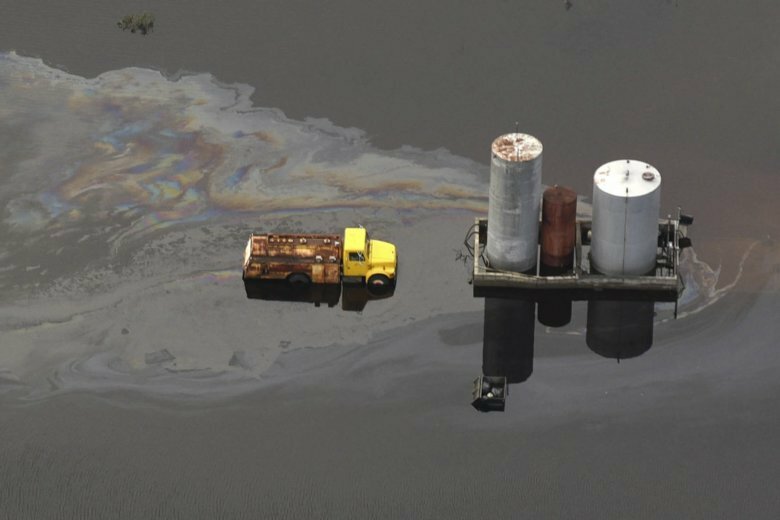 The North Carolina Coastal Federation said on its website Wednesday that massive amounts of polluted runoff are still flowing into coastal waterways all along areas of the state which were affected by heavy rains from Hurricane Florence. According to the federation, contaminated runoff is draining into coastal estuaries and the Atlantic Ocean through ditches, yards, parking lots and hundreds of other pathways. Coastal Review Online, which is published by the federation, reports that beach towns like Pine Knoll Shores and Emerald Isle are telling residents to stay out of standing water due to contamination and possible infections. A North Carolina university which evacuated students as Hurricane Florence approached has announced a new date for reopening the campus. Chancellor Jose Sartarelli of the University of North Carolina at Wilmington said in a statement Wednesday that employees will be allowed to return on Oct. 1, the date on which classes had originally been set to resume. Sartarelli said the school had been made aware of some employees who returned to Wilmington to find either significant damage to their homes, or the homes were total losses. The chancellor also announced classes will resume for most students Oct. 8, meaning students won’t be permitted to return to their residence halls until Oct. 6. On Tuesday, the school had said students could return this Saturday. Sartarelli said no decisions have been made regarding the cancellation of fall break and reading day. The Waccamaw River appears to be cresting in Conway, South Carolina, just under predictions. The river has spent more than 18 hours at just over 21.1 feet (6.4 meters), some 6 inches (15 centimeters) under the predicted crest from Hurricane Florence’s floods. If it doesn’t rise much more, that could avert potential environmental and transportation problems. State-owned utility Santee Cooper says the river water was still just inches below a coal ash pond at a closed power plant in Conway. And transportation officials say the floodwater from the river remains well below the top of a temporary barrier of sand and plastic on U.S. Highway 501, the main link to Myrtle Beach. The flood from Hurricane Florence is still well over the record flood levels from two years ago after Hurricane Matthew, and the water is not expected to drop below that level until next week. A North Carolina district attorney has dropped charges against a woman who took in more than two dozen dogs and cats during Hurricane Florence and was accused of practicing veterinary medicine without a license. A news release from the 8th Judicial District on Wednesday says the charges against Tammie Hedges were dropped Tuesday. District Attorney Matthew Delbridge said in a statement that with the safety of the animals ensured, dismissal of the charges against Hedges will minimize additional distractions and allow the North Carolina Veterinary Medical Board to take whatever action it deems as appropriate. Hedges, founder of Crazy’s Claws N Paws animal rescue, was arrested Friday after 27 dogs and cats were confiscated from a temporary shelter. A sheriff in a North Carolina county hit hard by Florence says 400 animals were rescued from a flooded property and 300 more were found dead. Robeson County Sheriff Kenneth Sealey issued a statement that says his office received calls that animals were stranded on a rooftop in the Orrum community. Some animals were given food by boat, and National Guard high-clearance trucks were used to rescue the animals Sunday. The nonprofit group Global Canine Rescue also helped. The sheriff’s office says the rescued animals included cats, horses, peacocks, chickens, quail and potbellied pigs. Ninety-seven were dogs. The Humane Society is among the groups caring for the animals. Sheriff’s investigator Katherine Floyd said in a brief phone interview that she was meeting with the prosecutor Wednesday to discuss possible charges against those responsible. South Carolina authorities say early estimates show about 2,000 homes have been damaged from floodwaters from Hurricane Florence and its remnants. State Emergency Management Division Director Kim Stenson said Wednesday those numbers are quite preliminary since flooding is still occurring and could affect hundreds or thousands of additional homes. Federal Emergency Management Agency Director Brock Long was in South Carolina on Wednesday. He urged anyone with damage from the flood contact FEMA as soon as possible to begin the claim process. FEMA says 4,000 people in South Carolina have already registered and they’ve already paid $500,000 in claims. The agency also added Georgetown County to five others in the state under disaster declarations to receive individual assistance. One South Carolina community is getting some good news from the latest predictions on flooding from Hurricane Florence. Georgetown County said on its Facebook page that flooding predictions for the hardest hit areas of the county have gone from 5 to 10 feet (1.5 to 3 meters) down to 2 to 4 feet (0.6 to 1.2 meters). Authorities still stress that’s higher than Hurricane Matthew’s floods in 2016, which set records in many areas. Officials say the flow of the Waccamaw River has slowed, delaying the peak of the flooding to Friday. But the county also warned that predictions on the river level are continually being calculated and could change again. Residents of a flooded North Carolina town are suing a railroad company, alleging it impeded efforts to plug a gap in a levee. Several Lumberton residents sued CSX Corp. this week claiming a railroad underpass owned by the company created a gap in a levee allowing floodwater to pour in after Florence. The plaintiffs say the company knew about the problem for some time and the gap exacerbated flooding during Hurricane Matthew in 2016. The lawsuit cites a May 2018 report by state officials calling for a floodgate and saying planning was underway. The plaintiffs say Lumberton officials were refused permission by CSX to build a temporary sandbag berm at the underpass as Florence approached. They say an emergency order by the governor allowed them to build a last-minute temporary berm but it was breached by floodwaters. CSX issued a statement that it doesn’t comment on pending litigation, but noted the “extraordinary storm” devastated Lumberton and other communities with its flooding. North Carolina is reporting another death caused by Hurricane Florence and its remnants. North Carolina Gov. Roy Cooper’s office says a 67-year-old man died while cleaning up storm debris in Craven County, and the state medical examiner’s office determined that the death was storm-related. State Emergency Management spokesman Keith Acree says the man died after falling and fracturing his neck while cleaning up on Sept. 18, days after the storm made landfall. The state has still been dealing with the storm’s after-effects including fallen trees, debris and floodwaters. Across multiple states, at least 47 deaths have been attributed to the storm. Conway firefighters say the city hasn’t seen many rescues or problems with the unprecedented flooding in the South Carolina city. Conway Fire Chief Le Hendrick in part credits how accurately predicted the flooding was. Firefighters went around last week with a map warning people they were going to flood even though they never had before. Hendrick said on Tuesday firefighters checked and those areas were flooded. The Waccamaw River in Conway was expected to crest on Wednesday at 21.7 feet (6.6 meters). It surpassed the previous record high of 17.9 feet (5.5 meters) set in 2016 by Hurricane Matthew on Friday. The waterway is not expected to drop below 18 feet or so until sometime next week. The river floods at 11 feet (3.4 meters).